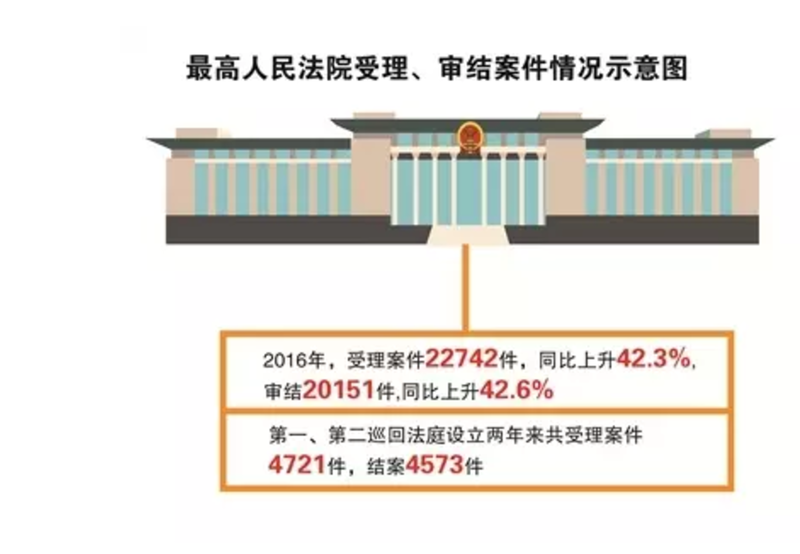 Most people who have commented (outside of China) on Supreme People’s Court (SPC) President Zhou Qiang’s March, 2017 report (on 2016 work) to the National People’s Congress (NPC) didn’t have the patience to read (or listen) much beyond the initial section, which mentions the conviction of Zhou Shifeng as indicating that the courts are doing their part to crack down on state subversion. It appears to be another in a series of colorless government reports. 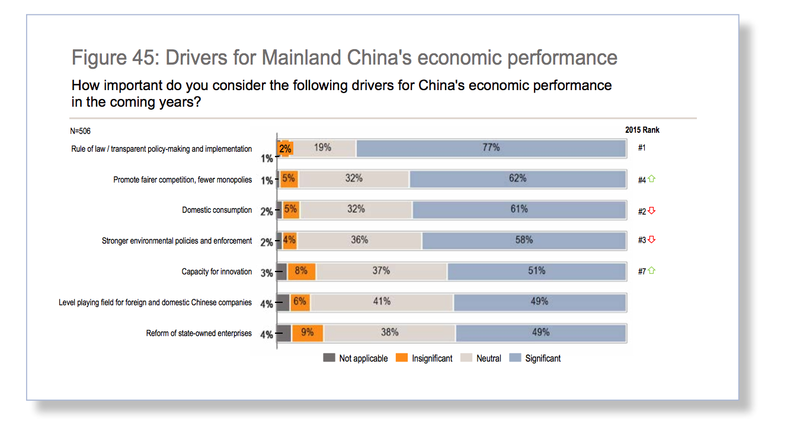 But for those with the ability (or at least the patience) to decode this report, it provides insights into the Chinese courts, economy, and society. A partial decoding of the report reveals the points listed below (to be continued in Part 2). 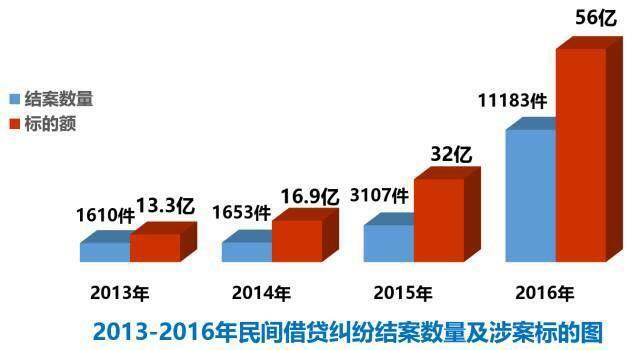 The caseload in the Chinese courts continues to rise significantly, at the same time that headcount in the courts is being reduced. Diversified dispute resolution (the jargon outside of China is alternative dispute resolution) is being stressed. SPC itself is dealing with a massive increase in its cases, 42.6% higher than 2016, and that number was significantly higher than 2015. The statistics on the SPC’s caseload are not broken down further, but are understood to be mostly civil, commercial, and administrative. It appears from a search of one of the case databases that not all of the SPC judgments or rulings have been published (a search of one of the judgment databases showed 6600+, and only some of the death penalty approvals). It seems also that the database does not include SPC cases such as the judicial review of certain foreign and foreign-related arbitration awards. changes in law giving litigants rights where none previously existed. The report also mentioned that 29 judicial interpretations were issued (some analyzed on this blog) and that 21 guiding cases were issued. Model cases and judicial policy documents were not separately set out, although some were listed in the appendix to the SPC report distributed to delegates. Although the stress in Zhou Qiang’s report is placed on law and order, in fact many more cases in the Chinese courts are civil and commercial rather than criminal. Criminal cases have a prominent place in the report, although the data reveals a slight increase in the number of cases (1.5%), involving the conviction of 1,220,000 people, down 1%. (Note that many minor offenses are punished by the police, with no court procedures). 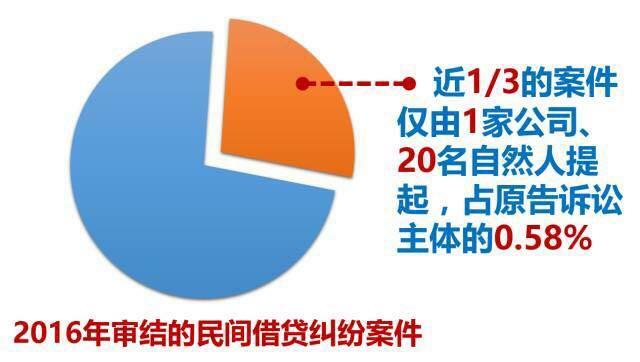 Although the report mentioned the Zhou Shifeng case (state security) and criminal punishment of terrorist and cult crimes, it did not release statistics on the number of cases of any of these crimes heard. Corruption cases totaled 45,000 cases, involving 63,000 persons. Violent crimes (murder, robbery, theft) cases 226,000. Drug cases: 118,000, a significant decrease from 2015. 2016 cases of human trafficking and sexual assault on women and children totaled 5335, while telecommunications fraud cases in 2016 totaled 1726. Only 213 cases involving schoolyard bullying were heard and the SPC revealed that the drafting of a judicial interpretation on the subject is underway. 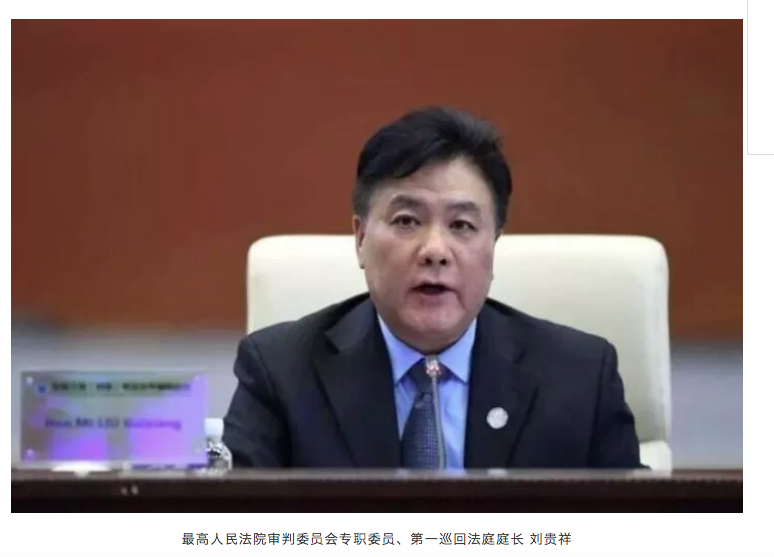 The report highlighted some of the well-known criminal cases, including the insider trading case against Xu Xiang and the Kuai Bo obscenity cases to illustrate and criminal law-related judicial interpretations to signal that the courts are serving policy needs in punishing crime. The same section described what has been done in 2016 to correct mistaken cases, highlighting the Nie Shubin case (reheard by Judge Hu Yuteng and colleagues) as an example. The report revealed that the local courts retried only 1376 criminal petition cases, likely a tiny fraction of the criminal petitions submitted. As President Zhou Qiang indicated, the way that the Chinese courts operate is Party/government policy-driven (they must serve the greater situation). 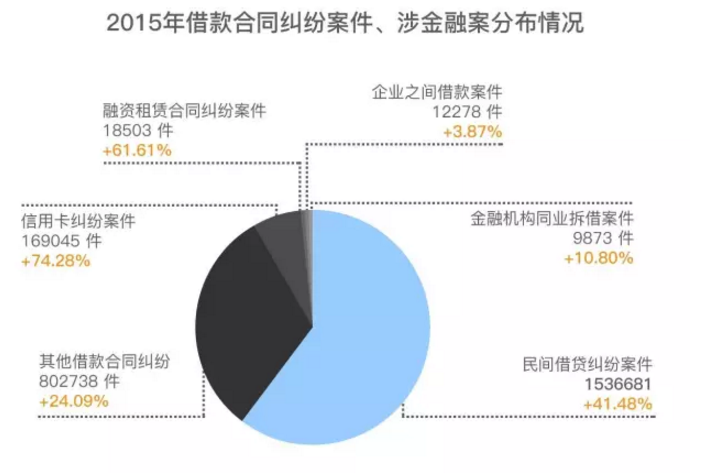 Serving the greater situation meant, in 2016, that the Chinese courts heard 4,026,000 first instance commercial cases, a 20.3% increase year on year. He also mentioned the 3373 bankruptcy cases analyzed in an earlier blogpost. Of those 4 million commercial cases, 1,248,000 involved securities, futures, insurance, and commercial paper and 255,000 real estate cases and 318,000 rural land disputes. Other implications are discussed below. 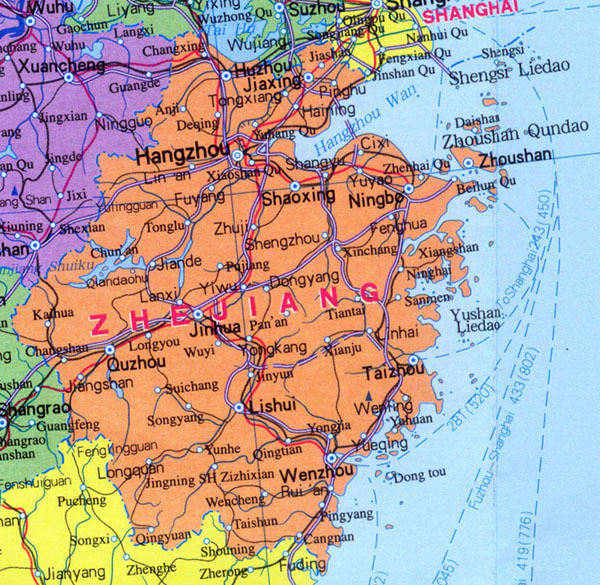 This section of the report devoted a paragraph to a topic discussed last year on this blog: the courts serving major government strategies, including One Belt One Road, the Yangtze River Belt, and Beijing-Tianjin-Hebei coordinated development. Green development , intellectual property (IPR), property rights (of private entrepreneurs), serving maritime and major country strategy, socialist core values, judicial solutions to new problems and cross-border assistance also merited mention in this section. 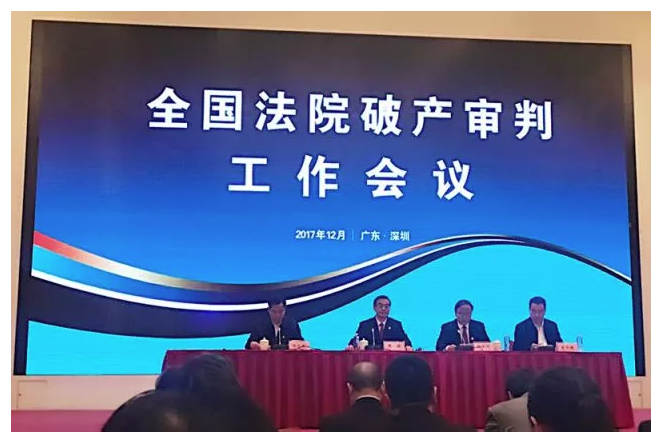 The courts heard 133,000 environmental and natural resources cases, with Fujian, Jiangxi and Guizhou courts designated as experimental environmental courts. While public interest environmental and procuratorate brought (environmental) cases were mentioned, statistics were not set out. 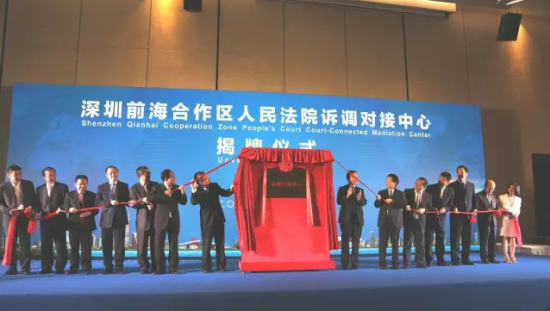 First instance IPR cases totaled 147,000, with several cities (Nanjing, Suzhou, Wuhan, and Chengdu) establishing IPR divisions to take cases across administrative boundaries. This section mentioned the Jordan trademark case and the IPR courts. On protection of property rights, the report mentioned some of the documents intended to protect private entrepreneurs discussed on this blog, as well as 10 model cases. On maritime and cross-border cases, the report mentions the judicial interpretations on maritime jurisdiction (discussed in this blogpost), intended to support the government’s maritime policy, including in the South China Sea. 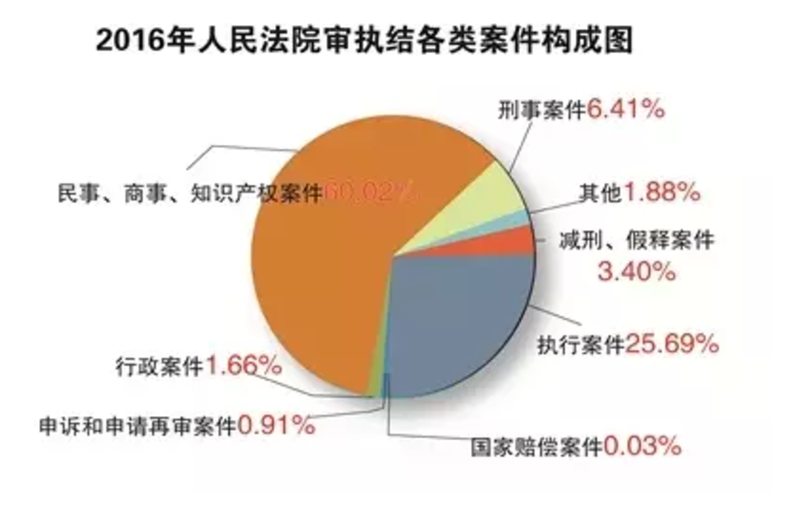 The Chinese courts heard only 6899 commercial cases involving foreign parties (this means that of the 2016 19,200 civil and commercial cases mentioned by Judge Zhang Yongjian, most must have been civil) and 16,000 maritime cases. 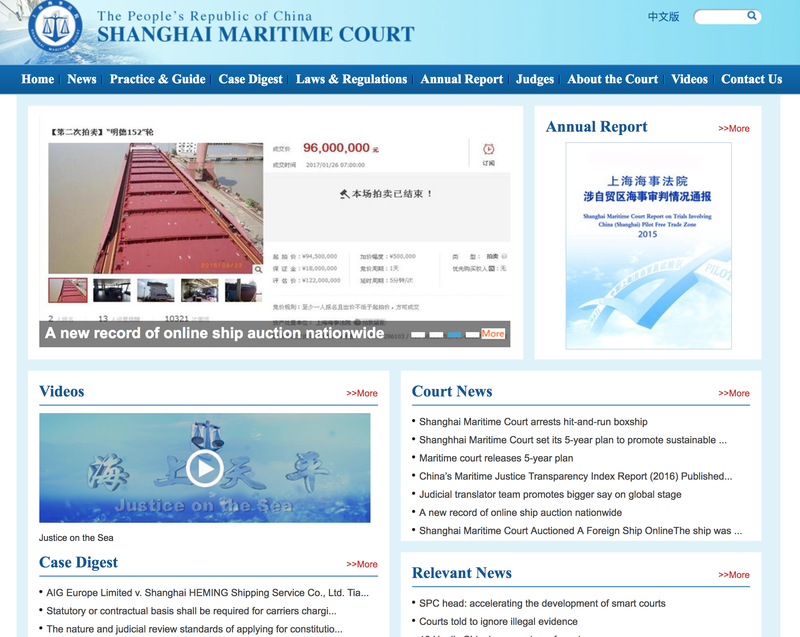 The report again mentions making China a maritime judicial center, further explained in my 2016 article. On the relevance of socialist core values to the courts, that is meant to incorporate socialist core values into law (although they should be understood to have always to be there) and to give the Langya Heroes special protection under China’s evolving defamation law. Judicial solutions to new issues included internet related issues, including e-commerce cases, internet finance cases, and theft of mobile data; the first surrogacy case, and judicial recommendations to Party and government organizations. In the section on international cooperation, President Zhou Qiang revealed that fewer than 3000 cases involving mutual judicial assistance were handled. The bureaucratic and lengthy procedures for judicial assistance in commercial cases has long been an issue for lawyers and other legal professional outside of China. This is likely to change (in the long run, as Chinese courts increasingly seek to obtain evidence from abroad). US-China dialogue on bankruptcy issues and cooperation with One Belt One Road countries (cases involving these countries are increasing significantly), were also mentioned here. From 1 July 2016, the Supreme People’s Court (SPC) is (in principle) broadcasting live all its public trials (public hearings) (better understood by those from a common law jurisdiction as an appellate court hearings) on its own Court TV website. 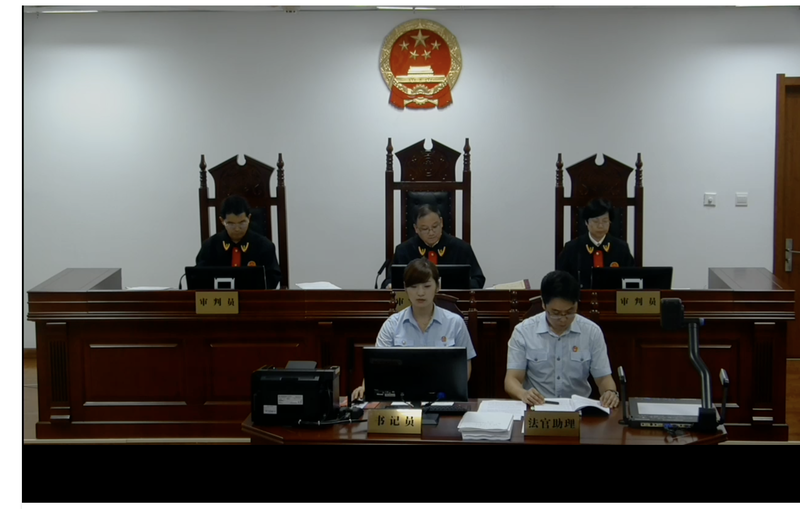 SPC broadcasts also include hearings by the #2 Circuit Court (in Shenyang) and #1 Circuit Court in Shenzhen. The technical platform is provided through Sina.com and a private company. The SPC describes its online broadcasts as its fourth transparency platform. Some of the cases that the SPC considers do not have public hearing procedures, such as its capital punishment review and judicial review of decisions concerning foreign and foreign-related arbitral awards. 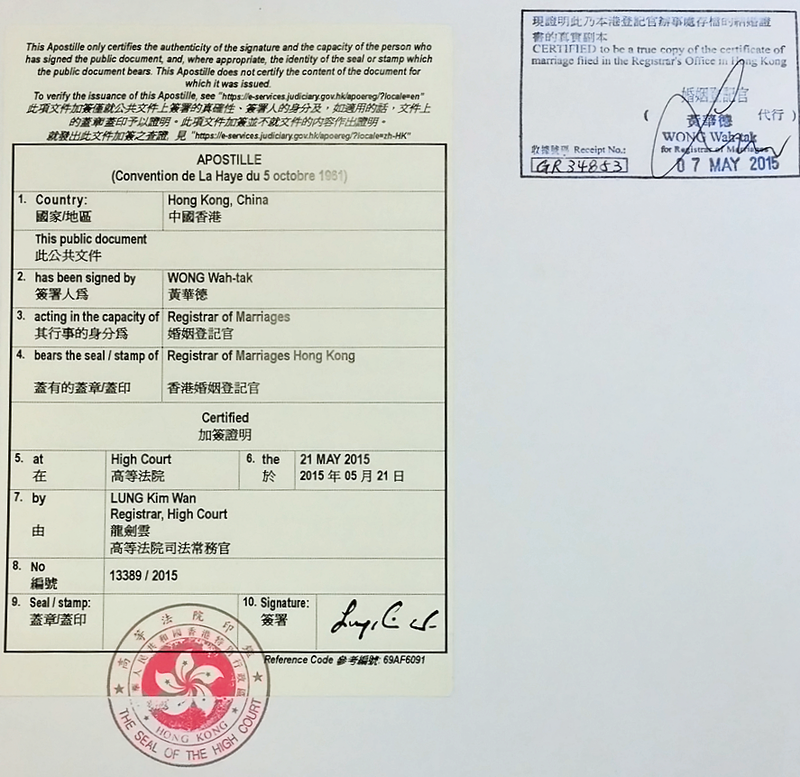 A Fujian investment co. v. Guizhou real estate development company (private lending dispute). It provides a window into the world of Chinese commercial disputes. the live webcasts will be significant progress for judicial openness. With full transparency of trials online, the public can better play their supervisory role. ..live webcasts will create a large amount of data that will help jurists study China’s legal system. Having their advocacy broadcast on line may also drive lawyers to strengthen their advocacy skills as well. For persons interested in the Chinese judiciary, it provides easy access to SPC court hearings, without the hassle of special permission, letters of introduction, and trips to Beijing. 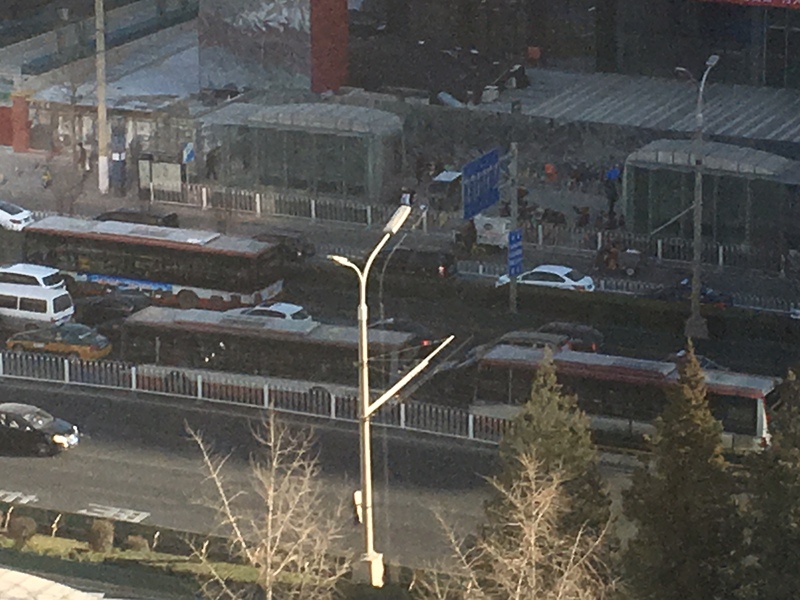 Lawyers in Beijing do not seem to be aware of this development, at least judging by the lawyer acting for TRAB, who arrived in the courtroom after the hearing began. This decision by the SPC raises a number of questions. Were the parties asked whether they consented to having their case broadcast on line? It is not apparent from the recordings that I have seen. Individual parties read out their personal identification numbers on the recordings. 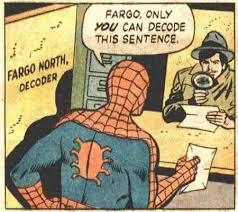 Could this be an invasion of their privacy? Article 11: In any of the following situations, for trial activities that are conducted openly in accordance with law, the people’s courts may use television, the internet or other public media to broadcast or record images, audio or videos. The 2010 regulations on the broadcast of cases (关于人民法院直播录播庭审活动的规定) lack specific procedures enabling individuals to protect their rights. Do judicial reforms contemplate more specific procedures enabling litigants (or defendants) to refuse to have their case broadcast online? Mac users may find that the platform works better through the Safari browser than Google Chrome. What’s new in the Supreme People’s Court’s diversified dispute resolution policy? The objective of the document is to promote a more sophisticated, efficient, and effective approach to dispute resolution that will reduce social tensions. Part of the objective is to reduce the number of cases filed, heard, and tried by courts. For commercial disputes, it is intended to push disputes to institutions that can more competently, efficiently and timely mediate cases and better mediate cases within the courts by involving court-annexed mediators, before or after the person or entity files suit. The implications of this document for the reform of labor and rural land contract dispute resolution remain to be seen. The Diversified Dispute Resolution Opinion requires better linkages between other institutions and the courts, so, for example, that mediation agreements can be enforced without a re-hearing in the courts. It stresses Party leadership while emphasizing that forces in society can do a better job of dispute resolution than official ones. The document also cautions against borrowing institutions wholesale from abroad. What does all this mean for making people “feel justice in every case” when some persons and institutions enjoy a better quality of dispute resolution than others? You have less than one month to provide your views to the Supreme People’s Court (SPC) and influence the SPC’s thinking on Company Law issues. The SPC is looking expand the rights that (minority) shareholders, creditors, and employees have vis a vis the company and its majority shareholder or actual controller. On 12 April, the Supreme People’s Court issued its draft Company Law interpretation for public comment, (linked here, with part of a bilingual version found here. WestlawChina has a translation, available to subscribers). Comments should be sent to the addresses specified in the notice: by email to: gsfjss_yang@163.com or by mail/courier to Judge Yang Ting, #2 Civil Division, at the SPC. The deadline for public comments is 13 May. Issuing the draft for public comment required the approval of the SPC leadership (the judicial committee), according to SPC regulations. Many foreign investors take minority stakes in Chinese companies (or lend to Chinese companies) and find, to their sorrow, that the majority shareholder has abused his position and the minority shareholder or creditor. The files of law firms, accounting firms, arbitration organizations, and Chinese courts are filled with these cases. To the cognoscenti, this judicial interpretation reads as a guide to (combatting) the well-known strategies of unscrupulous majority shareholders, which include: fraudulent board or shareholder resolutions; board/shareholder resolutions adopted without the necessary quorum; board/shareholder resolutions approving related party transactions that harm creditors; blocking minority shareholder access to company books and records. All entities with investments in China are affected by this provisions in this draft judicial interpretation. The International Finance Corporation, Temasek, Kuwaiti Investment Authority and others should have their lawyers review and provide comments on its provisions. The law committees of the foreign chambers of commerce in China and Hong Kong (Amcham, Eurocham, Auscham, SingCham, etc.) and the lawyers for the PE/VC communities (not to mention the banks) should consider submitting comments, as well as those interested in Chinese corporate governance. Its provisions apply to both private (limited liability) and public companies (ones limited by shares), although some provisions only apply to private companies. The issues in the draft interpretation, highlighted below, reflect the issues that have arisen in litigation in the lower courts on the rights of shareholders, particularly minority shareholders, particularly since the Company Law was amended at the end of 2013. Many of its provisions will be applicable to arbitration proceedings involving Chinese companies. 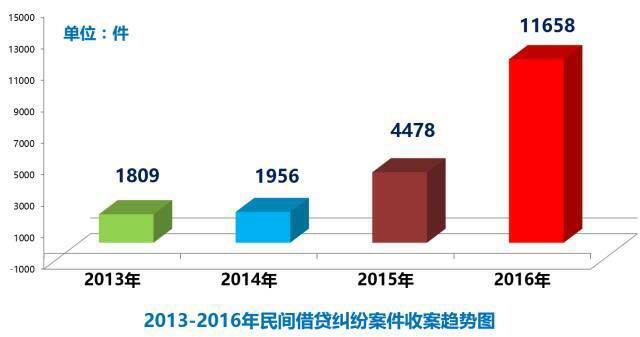 There has been an increase in litigation among shareholders and litigation between shareholders and companies and that is likely reflected in the statistics of arbitration organizations hearing disputes involving Chinese companies. Thus far, I have seen one law firm analyze the draft, and I will update this blogpost with links to other analysis as I encounter them, such as this one by the Han Kun law firm. A quick guide to some of the issues highlighted in the draft follows below. These issues are addressed in the first 12 articles of the draft, putting some meat on the bare bones of the Company Law, and giving minority shareholders, creditors, and employees greater rights. Under this draft, shareholders, directors, supervisors, or senior management, creditors, and employees with a direct interest in the matter may file a challenge to the validity of a resolution under Article 22(1) of the Company Law, which provides that the contents of a resolution of one of those meetings are be invalid if they are in violation of laws or administrative regulations. As to the grounds for invalidation, the draft specifically mentions: a shareholder abusing his power as a shareholder through a resolution that harms the interests of the company or other shareholders and decisions that excessively (过度) distributes profits or improper related party transactions that harm the interests of creditors. The draft also enables parties to apply for an order to stop the implementation of the invalid resolution. The second section of the draft interpretation defines further and provides procedures for enforcing a shareholder’s right to know under Article 33 (for private companies) and 97 (for companies limited by shares). It is not unusual for a company to block minority shareholder access to company books and financial records, particularly when there has been a falling out between shareholders. Under Article 33, a company shareholder can inspect and duplicate the company’s articles of association, the minutes of the shareholders’ meetings, the resolutions of the board of directors, the resolutions of the board of supervisors, and the financial and accounting reports of the company. Under Article 97, the rights of shareholder in a listed company are more limited. Under the draft, a shareholder will be able to designate an agent to review the company records, particularly important for financial and accounting records. The exercise of the right to know is often the precondition for being able to file suit under the first section. Section three of the draft sets out three articles setting out procedures by which a shareholder can enforce his right to have profits distributed. Section four of the draft addresses the right of first refusal–the priority right that existing shareholders have to purchase the shareholding of a party intending to transfer all or part of his shareholding to a third party. Anyone involved in corporate practice in China will have encountered situations in which the selling shareholder engages in various types of strategies (generally misleading the other shareholders) to avoid selling to an existing one. The draft defines “under the same conditions” as used in Article 71 of the Company Law as being holistic–the price, payment method, timeline for payment, and other factors. The draft also sets out the content of the notice to other shareholders, and most importantly, spells out situations in which a contract transferring shareholding to a third party can be invalidated, which include failing to inform the other shareholders (and other legal requirements) and changing (i.e. reducing) the conditions of sale to the third party after the existing shareholders have waived their right. The author of the article mentioned above mentions that the draft does not deal with indirect structures, designed to prevent the existing shareholder from exercising his rights, as illustrated by the Fosun/Shanghai Soho dispute. The last five articles of the draft address the mechanics of derivative litigation, including the type of company approval required for the litigation to be settled (mediated), as well as the important issue of the plaintiffs claiming reasonable lawyers, notaries, assessors, and other related fees. The draft permits what is known as “double derivative” litigation–the pursuit of a claim on behalf of a wholly owned subsidiary, a concept found in Delaware and English law. This recent article reviews recent Chinese cases on double derivative litigation, including one from the SPC, and quotes from the American Law Institute’s book Corporate Governance: Analysis and Recommendations. Those with further questions about providing comments on this draft may either use the comment function on this blog or email me at: supremepeoplescourtmonitor.com. I recently published an article in The Diplomat entitled “China’s Maritime Courts: Defenders of ‘Judicial Sovereignty,” focusing on what Supreme People’s Court President Zhou Qiang meant when he mentioned that China would establish an international maritime judicial center (国际海事司法中心). Many thanks to Professor Vivienne Bath for her research on parallel proceedings and choice of court issues involving China, as well as several others who provided their insights.